Teach your little one how to recognize letters and spell their name with this charming personalized book. Reading this personalized book to my nieces first child is such a gift. I believe the way it is put together is wonderful for all ages. Perfect surprise for my niece who is learning to read and loves books. 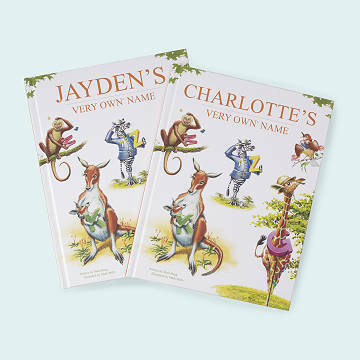 The book personalizes the child's name so hopefully with fun examples of the letters. This a good way to start early reading in children it also has the alphabet, and being personalized makes it easier to get the child's attention. The most fav gift hands down. This was a gift given to the littlest family members in our family this year. It is so special and so well done. We are thrilled. These books will be in the family forever. It is something we will keep and cherish to hand down for generations! Best gift for new parents! My daughter and son in law loved this book when we gave it to them for their first baby. This book is excellent to read to little ones. It not only teaches them how to spell their name, it also teaches them about animals. Very happy with my purchase!